Fermentation is the name given to the action of bacteria, yeasts or other microorganisms. During the process carbohydrates are converted into either alcohol or organic acids under anaerobic conditions. Fermentation will sometimes happen spontaneously, and can also be encouraged! There are broadly 2 types of fermentation – Wild ferments and culture-based ferments. Wild fermentation, is where you let natural bacteria and yeasts do the work for you. These are simple, as you don’t need to any any kind of starter culture. Examples are sauerkraut and sourdough bread. Culture-based ferments require the addition of a live starter culture of some kind in order to introduce the desired bacteria and/or yeast colonies. Examples are kefir, kombucha and yoghurt. Technically, starters that are a mixture of yeasts and bacteria in solid form like kombucha mothers or kefir grains are called SCOBYs which stands for Symbiotic Colony Of Bacteria and Yeast. The chief benefit of consuming live fermented food is the bacteria themselves. These so called ‘friendly’ bacteria work in our gut to digest food and absorb essential nutrients. Gut bacteria play an important role in immunity, and have also been shown to effect our mood an stress levels. 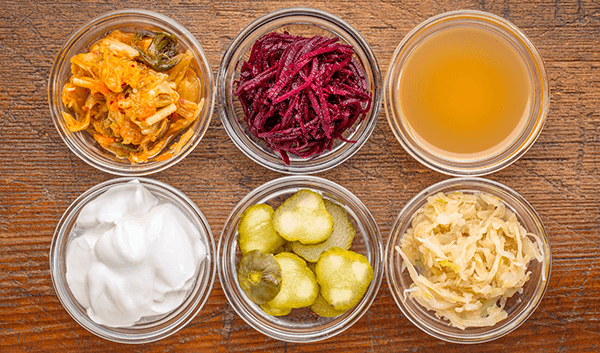 In order to get the benefits of these live bacteria, it’s important not to heat or cook your fermented food or drink, as bacteria are easily killed. Most of the good bacteria will die at something like 55C (around 130F). They don’t mind the cold, though – it’s fine to chill or even freeze your ferments. 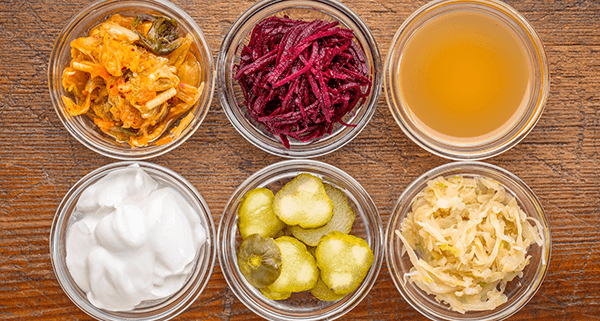 In addition to the healthful effects of consuming live foods, fermentation also has a host of benefits that remain if the end product is cooked and the bacteria are killed. The process of fermentation essentially ‘predigests’ food, making it easy for us to process and absorb the nutrients. It also nutralises some poisons, and even creates new nutrients. A good example of this is sourdough bread which (unlike normal commercial bread) has a long fermentation period. It makes the finished product way more digestible, and more nutritious to boot. Occasional batches of kraut go mouldy and have to be discarded, but this risk is reduced to (almost) zero if you choose the right kind of cabbage – see note in sauerkraut post.